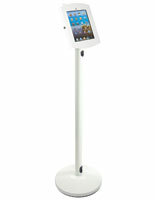 This iPad kiosk with locking case features an attractive silver gloss finish. 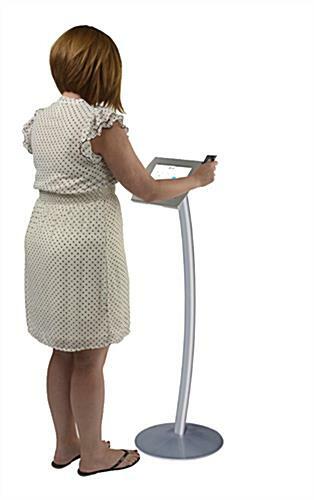 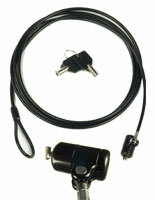 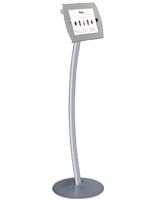 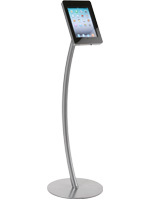 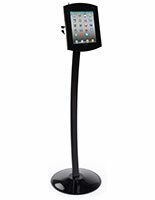 The 45.5" tall fixture has an aluminum floor stand base with a steel tablet mount. Each silver finish kiosk with locking case allows users to access installed devices' charging and audio ports and camera but eliminates the ability to use Home functions. 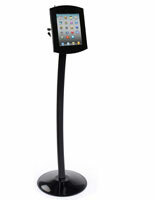 This type of tablet mount is ideal for use as POS displays in commercial, retail and professional environments. 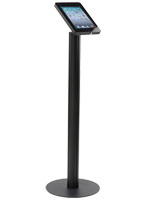 The sturdy kiosk with locking case is designed for use in high traffic areas such as restaurants, stores, trade shows or businesses. 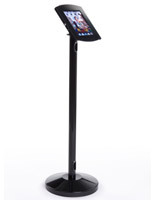 Each freestanding floor stand is designed to keep installed tablets secure and includes a K-slot for optional cable-locks (sold separately).